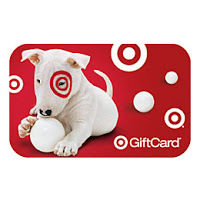 FREE $10 Target gift card with $50 grocery purchase! Here’s a GREAT reason to shop at Target today! 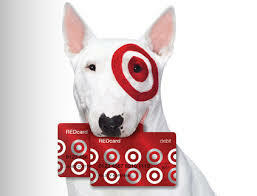 You can get a FREE $10 Target gift card with a $50 grocery purchase! Text GROCERY to 827438 to get your coupon for this offer! I saved $85 doing these deals and got a $10 gift card to spend on my next trip! Buy 2 select Tyson, State Fair, or Ball Park Frozen items, get a FREE $5 Target gift card! Spend $5.98 out of pocket, get a $5 Target gift card! It’s like you’re paying $.49 per box of corn dogs! Spend $7.98 out of pocket, get a $5 Target gift card! It’s like you’re paying $1.49 per bag of chicken nuggets! 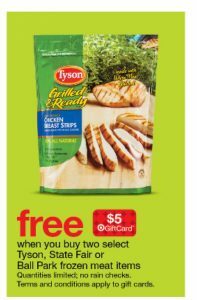 There is also a coupon for $.75 off Tyson grilled products that will work with this deal! All 12 pack, 12 ounce soda is 3/$10. Download the 25% off Cartwheel coupon and they’re just $2.50 each! It’s hard to find coupons for produce! This Cartwheel coupon is good for all fresh fruits and vegetables – up to 50 items!! Get Ritz crackers for just $1.50 per box with the 40% off Cartwheel coupon! Get Nathan’s Famous hot dogs for just $3.19 with the Cartwheel coupon! Eggo products are on just $1.80 each with Cartwheel! Tostito’s chips are just $1.87 each with the 25% off Cartwheel! General Mills cereals are just $2.37 per box with Cartwheel coupons! Market Pantry shredded cheese is $1.90 per bag with Cartwheel coupons. Make sure you check your meat section for markdowns. Combine those discounts with the 5% off Market Pantry pork chops, 5% off Sutton & Dodge Choice Angus Beef, 5% off Market Pantry ground beef, 5% off Market Pantry chicken and more for even GREATER savings! What other deals did you find? Scan your free $10 gift card promotional coupon FIRST before any other coupons! You can “roll” the Tyson/BallPark/State Fair gift card into additional deals! If you have more than one text coupon for the $10 gift card promotion, you need to use it in a separate transaction. NOTE: This post contains affiliate links. Please refer to my disclosure policy for more information. Free Icee for Red Card Holders at Target this week! If you love TARGET, make sure you have a Target Red Card. I admit it. I put it off for WAY too long. 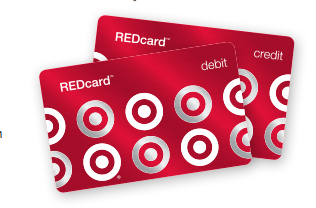 This month, Target has special promotions for their Red card holders, too! 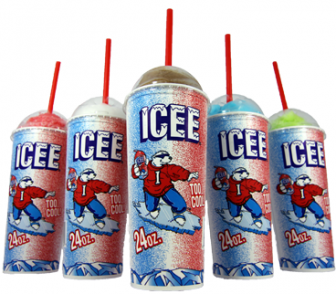 This week, you’ll be able to score a free small Icee with your Red card! No purchase necessary! I use these to bribe my kids all of the time, so I love this deal! Cereal stock up sale at Target! If you’re ready to stock up on cereal this week for when your kids head back to school, don’t miss this Cereal stock up sale at Target! When you buy 5 participating cereals, you’ll get a FREE $5 Target gift card! Spend $10 out of pocket, get a $5 Target gift card! These coupons will also work for the sale: all coupon links take you directly to the clipped coupon so you can print easily! The best part is you can “roll” your gift card from the first promotion into the deal again, which means you’ll only pay $5 out of pocket next time or just $1 per box! I always keep a Target gift card on hand for deals like this one! Chocolate Lucky Charms – I didn’t even know these existed! Buy 2 Quilted Northern Toilet paper, get a $5 Target gift card! NOTE: If you already have a Target gift card to “roll” into this deal, you’ll pay just $21.38, which is $10.69 per package, which is an AWESOME price! There are lots of other great deals including deals on backpacks and lunch kits! This is a sponsored post and I am being compensated. All opinions are 100% mine. Please refer to my disclosure policy for more information. I work full time and have two kids who are involved with activities outside of school, so I am pretty much always on the go. I’m always looking for ways to save money, and our grocery budget is definitely our biggest expense! As I browse the grocery ads each week, it seems like there are always a few “hot” deals at each store, but I definitely don’t have time to visit four or five stores on the weekend when I do my shopping. 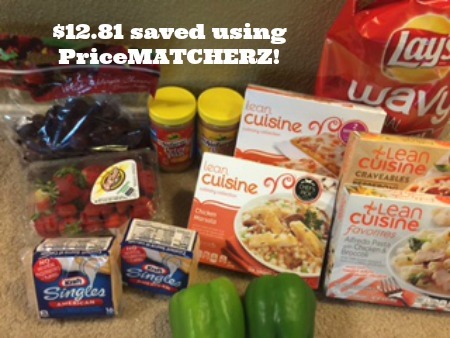 PriceMATCHERZ is a free website that helps you save time AND money on your groceries! They highlight the top grocery deals for major stores in your area each week, so you don’t even have to spend time looking for the ad! 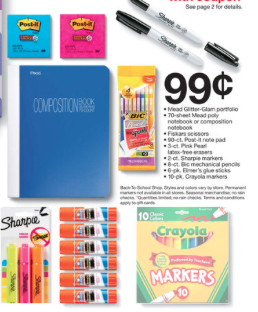 You just check out their list, make your list, and head to Walmart ready to price match! This week I had about 40 minutes to make a quick grocery trip while my daughter was at swim practice. I am not a huge Walmart fan, but they just opened a new Walmart Neighborhood Market nearby, and I have been wanting to check it out. It took me less than five minutes to put together my list using the top deals on the PriceMATCHERZ site. So, I spent $22.43 out of pocket on these items, but I saved $12.81, and I saved time because I didn’t have to visit multiple stores or look at all of the ads to figure out which deals were the best! I was able to get all of my shopping done and get back to swim practice before it was over! In my book, that’s PRICELESS! Make sure you check out the PriceMATCHERZ tips before you head to the store, especially if you’re new to price matching at Walmart or if you haven’t done it in awhile (some policies have changed). Target Tide Gift Card Deal! If you love Tide, don’t miss out on this Target Tide Gift card deal! When you buy two participating Tide products, you’ll get a bonus $5 gift card with your purchase! You can also use coupons on this deal and you can “roll” the gift card from one transaction into the next transaction! Stock up and save! All of these products contain 25% more detergent for FREE. This means you’re getting 2X the Tide at a HOT price! !